Cheryl Spencer Collin is an accomplished sculptress who has been designing and producing her own line of limited edition collectibles, including historical homes and lighthouses, since 1984. Cheryl is recognized for her commitment to authentic reproductions. She begins her lighthouse originals by researching all the fine details for each sculpture, including landscape and animals unique to each. Cheryl calls this a "sense of place". Cheryl relies on additional help from photos, actual Coast Guard blueprints and information from local conservancies to achieve her authenticity. She then painstakingly sculpts each site, as well as the lighthouse itself. 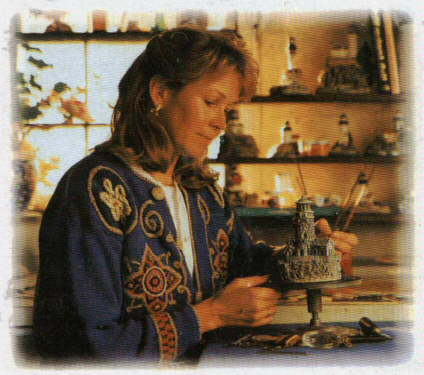 Since Cheryl does all the sculpting herself, Spencer Collin Studios produces a one artist collectible. All reproductions are carefully hand painted to highlight the flora and fauna accurate to the miniature's real-life region. Artists also touch their brushes to cast a whimsical light on such details as a loggerhead turtle, pelicans, and spotted sand pipers running through the sea grass. Each of the pieces in this series includes a wooden display base, as well as a magnifying glass to spot the intricate details of each piece. Look closely for hidden treasures, such as puffins, harbor seals, a moose grazing, fishing poles, a picnic setting, and many more, varying from piece to piece. Spencer Collin Studios is no longer producing new pieces, and as these are limited editions, sales will be limited to items still available. Purchase these truly collectible items while quantities last.